What's Next: The Global e-Commerce War: Walmart has just agreed to spend $16 billion for a 77% stake in India's Flipkart e-commerce company, pitting itself against Amazon in the fight for India's 1.3 billion-person economy. 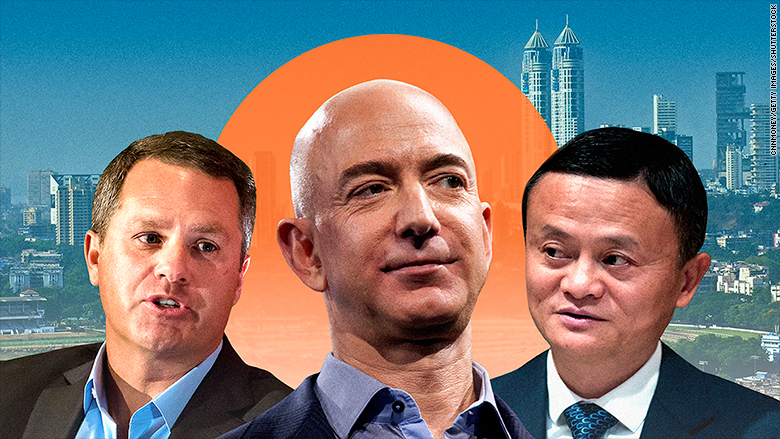 India is now the main arena in Amazon and Walmart's global battle for the future of e-commerce (outside China). Jeff Bezos has committed at least $5.5 billion to Amazon's India business and has launched Prime video and music services there. Walmart's Flipkart investment could undermine those efforts. WSJ also reports that Google has discussed joining the Flipkart investment, a move that would pit two of the US' biggest tech giants against one another in the subcontinent. The Big Picture: India is the world's fastest growing major economy. Morgan Stanley believes rapid economic growth and a dramatic rise in smartphone and internet could make India's e-commerce market worth $200 billion by 2026. Meanwhile, in Pakistan ... Chinese e-commerce giant Alibaba has acquired the Pakistani retail service Daraz, -- a move that provides more evidence for our theory that the lines of the future geopolitical map are being drawn by US and Chinese tech companies. Good morning. How long til flying taxis? Uber chief product officer Jeff Holden told me yesterday that flying taxis will be available for public use by 2023 and should be autonomous by 2028. He says they will be affordable -- think UberX pricing -- and far more cost-effective than owning a car. In fact, he believes private car ownership will become a niche hobby. Watch the full interview later today at CNNPACIFIC.com. • Android P: The new mobile software "will debut later this year .. with gesture-based navigation, battery saving features and an impressive new text selection tool that works on photos and the real world." • Google Assistant: "Google's voice assistant has six new voices and one from John Legend ... It will place phone calls for you and accomplish simple tasks, such as making an appointment. ... An optional Google Assistant feature will reward polite kids with replies, such as "Thanks for saying please.'" • Google Lens: "If you take a photo of text ... Google Lens will let you copy and paste the text from that image. It can also ... [link] to a Spotify artist when you photograph a concert poster ... [and] match the style of a piece of clothing from a picture." • Google Maps: "In the Maps app, Google Lens will help you navigate by detecting what's in front of you and overlaying directions on the street you see. A new, cute animal cartoon will help show you the way." • Google says it will relaunch Google News with "a new set of AI techniques" that analyze stories in real time and organize it into categories and storylines. • Google News will draw content from "trusted news sources," though it's not exactly clear what qualifies as a trusted news source. The service will not use human editors, nor will it partner with specific news organizations. • Google's AI will also be responsible for separating content into news, opinion and analysis ... It will also offer a "daily briefing" that gives everyone the same top stories as well as specific stories that matter to them. • "Before Google made a series of product announcements ... its CEO took a moment to deliver a message that would have been jarring to attendees just a couple years ago: Don't be overly idealistic about tech." • "It's clear technology can be a positive force, but it's equally clear that we can't just be wide-eyed about the innovations technology creates," Sundar Pichai said. ... "There are very real and important questions being raised about the impact of these advances and the role they will play in our lives." The Big Picture: Tech companies are upping their emphasis on values and ethics, but the product offerings are fundamentally the same: New innovations that make big tech indispensable to all of us, giving them unprecedented influence over our lives and unprecedented access to our data. • "Family of apps": Facebook, Instagram, Messenger and WhatsApp. The division will be run by chief product officer Chris Cox. • "New platforms": Virtual reality and artificial intelligence. The division will be run by chief technology officer Mike Schroepfer. • "Central product services": Ad sales, personnel, user security. The division will be run by vice president of growth Javier Olivan. Bonus: Facebook has also appointed Jeffrey Zients, the former director of the National Economic Council under President Obama, to its board. How to Read It, via Recode's Kurt Wagner: "The moves ... are meant to improve executive communication and user privacy, but the changes also come as Facebook contends with the backlash from the U.S. presidential election, revelations of manipulation by the Russian government and the recent Cambridge Analytica scandal." The Big Picture: Mark Zuckerberg still runs the company. Amazon is gaining support in its war with the Seattle City Council over a new tax proposal that could cost the company $20 million a year. The proposed "head tax" is an effort to combat homelessness by taxing companies $540 per employee, per year. • More than 100 local tech executives, entrepreneurs and investors, who have written a letter calling on the city council to abandon the tax. • Dozens of Seattle businesses, which say the tax would have a negative impact on smaller companies. • Two former Seattle mayors, who wrote an op-ed in the Seattle Times calling the tax plan "misguided." The Big Picture: Seattle, San Francisco and other cities are struggling to balance the benefits of the tech boom with its affect on housing prices and the cost of living. Homelessness is a major problem in these cities, and there is no obvious remedy. The Fox Wars: Comcast to bid in June? • Comcast is talking to investment banks about usurping Disney's $52-billion bid for 21st Century Fox, as we reported yesterday. • The plan being discussed would see Comcast make an all-cash offer of around $60 billion for the same assets Fox agreed to sell to Disney. • Bloomberg's Molly Smith calculates that a Comcast-Fox acquisition would leave the company with $170 billion in debt. • The VC fund would "invest in digital and international media businesses." • "Murdoch has begun to tell associates that he isn't going to Disney." • "Lachlan Murdoch, James's older brother, is expected to become chief executive of the remaining Fox company, so-called New Fox." Disney earnings beat expectations, buoyed by "Black Panther" and "Avengers: Infinity War," as well as the enduring strength of its theme parks. • "Disney reported revenues of $14.548 billion — $1.2 billion more than the same period last year." • "Every segment of Disney saw increased revenues, with the biggest gains in its studio, and parks and resorts." • "Revenues for studio entertainment rose 21% this quarter compared with the same period a year ago. Parks and resorts saw revenues rise 13%." The Big Picture: Disney is a behemoth, and every dollar it makes is another dollar it has in its battle with Comcast for rights to Fox. What Next: Draymond Green explains why the Warriors care about titles, not competitors. Game 1 of Golden State vs. Houston, the greatest series of the entire NBA Playoffs, tips off Monday at 6pm Pacific on TNT.